Maharaja’s final hours were streamed on Facebook live giving people worldwide the opportunity to witness the glorious death of a Vaishnava, and the immense love, care and tenderness devotees surrounded and assisted him to get through the final test and achieve his goal of life. The doctors in the room were constantly checking on Maharaja’s vital signs, and when they finally declared him dead at around 4AM, devotees shouted out on the top of their lungs “Jay Jay Shri Radhe Shyam! Jay Srila Prabhupada! Jaya Gunagrahi Goswami Maharaja!”, their faces relfecting the mixture of sorrow and joy. 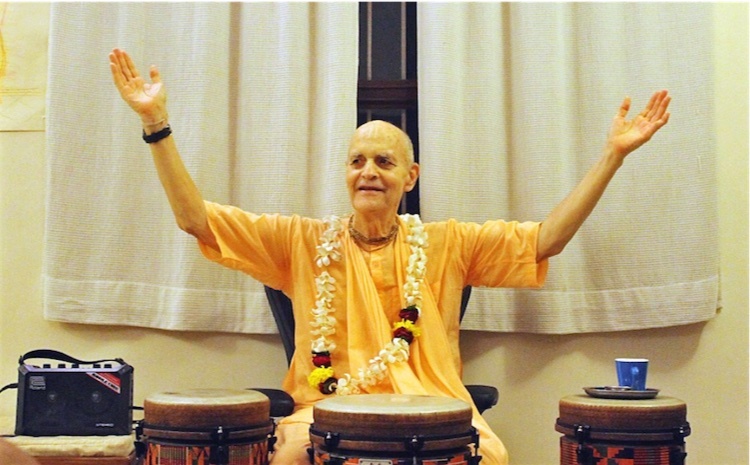 “He was such a kind loving devotee. A radiant star has stopped shining in this world… but now glows brilliantly in Goloka Vrindavan,” BB Govinda Swami says.